Erika and I enjoying ourselves at The Chocolate Bar. Erika and I have been friends ever since we met as sorority sisters back in College. Even though I had a great time with the girls, I have never been so happy to finally head home to my warm bed with my sweet husband and precious baby sleeping away in her crib. The rooftop bar was decked out in a tropical island theme and was lit all the way around with cute little tiki torches. 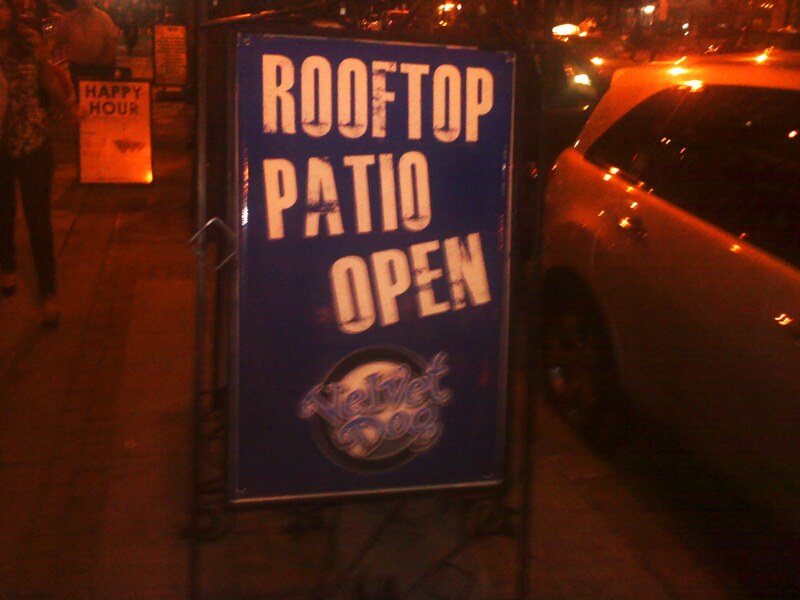 The Velvet Dog has a rooftop deck with an amazing view of the city. I wish I could of taken a better picture of the buildings all lit up but nothing was turning out. After dinner, we decided to walk down the street to The Velvet Dog for a little dancing. Our group enjoying our girls night out. For dinner, I ordered the corn ravioli. I wasn't sure what was going to show up, but oh my, so delicious! The ravioli filling was ground up corn mixed with ricotta cheese. I would love to try to make something like this at home, however, I just don't think I could really duplicate it. This restaurant was so different. I have never been to anything like it. Every menu item was made out of corn! We first decided to try the popcorn appetizer. Who knew popcorn sprinkled with balsamic vinaigrette dressing and caramelized onions would be so delicious? After having drinks and appetizers at The Chocolate Bar, we headed down to The Warehouse District to The Crop Bistro and Bar. My friends and I started a book club back in 2005 and it is still going strong. We originally started out with four members and our group has since expanded to seven of us. Our husbands like to joke with us that basically this is really a wine club where we occasionally discuss a book that we may or may not of read. Regardless, it's all about getting together every other Tuesday for some girl time. Kids are optional. You are more than welcome to bring them along, but if Mommy is looking for a relaxing night out, then certainly leave them at home for the hubby to watch. At one of our last meetings, Erika mentioned that she read an article in Parent's Magazine about the importance of maintaining your friendships after baby and that you need to make a point to have a girls night out a few times a year. So who were we to argue with Parent's Magazine? So Erika planned a weekend staycation in downtown Cleveland for the book club girls. Saturday consisted of a day at the Spa, drinks, and then dinner. Followed up by a little dancing at night. Erika also had made hotel reservations downtown for those who wanted to spend the night and not have to worry about driving home late at night. I opted not to go to the Spa or stay at the hotel. As excited as I was to hang out with my friends for the evening. I was not ready to leave Jillian yet for an extensive amount of time, especially overnight! I know the day will come when I will have to spend the night away from Jillian but I would prefer to spend my first night away from Jillian with Jeff. Our first stop for the evening was "The Chocolate Bar". The Chocolate Bar is located in the trendy E 4th district in downtown Cleveland and specializes in pretty much everything made out of chocolate. It sounds like y'all had a great time. I'm in a book club too that's been dubbed "The Worst Book Club Ever"! We pretty much eat, drink, laugh hysterically & sometimes mention a book!! So good for you! I really need to do more of this type of thing, but I'm so much like you...if I'm going to spend time away from Gillian Grace, I want to be with my husband. GG's 14 months and I still haven't spent a night away. Bret has of course, on business and what not, but not me. We are getting ready to go to Gainesville for Florida's Homecoming and GG will be staying with my parents so we'll see how this goes. Looks like you and your girlfriends had a ball. Karen - I am not sure I have ever posted a comment on your blog, but I have been reading for awhile. I also have a new baby at home (actually he's 7 months old, but it still feels new to me). I really love your blog. It's so real and I constantly find myself able to relate to your posts. There are a lot of blogs out there that make me feel inferior, but your blog makes me feel normal. I just wanted to thank you for that. Keep up the awesome work and I hope you have a wonderful weekend. Just stopped by from Kelly's Korner and love your blog! So nice to have a girl's night out and have fun!